$276.6 - Baxton Studio BBT6469-Twin-Black Cosmo Modern & Contemporary Black Faux Leather Twin Trundle Bed - 36.47 x 42.71 x 84.83 in. Home Furniture>Bedroom>Beds>Beds Baxton Studio BBT6469-Twin-Black Cosmo Modern & Contemporary Black Faux Leather Twin Trundle Bed - 36.47 x 42.71 x 84.83 in. Baxton Studio BBT6469-Twin-Black Cosmo Modern & Contemporary Black Faux Leather Twin Trundle Bed - 36.47 x 42.71 x 84.83 in. When space is at a premium why not consider investing in one of our uniquely practical guest beds a twin size bed with a fabulous concealed trundle bed that sits neatly under the main bed on castors for ease of maneuvering and framed in the same luscious faux leather so that once replaced under the bed guests would not know that another sleeping compartment exists. Our striking new Cosmo is minimal in design with a stunning contemporary edge to it featuring solid clean lines a black faux leather upholstered solid wooden frame with padding affording it to sit perfectly in bedrooms where space is at a premium. The Cosmo Bed features a modern framework low foot board simply a leather clad wooden frame with sprung beech slats for the ultimate in comfort and then finished with a striking faux leather headboard quite simply the Cosmo bed is perfect where space is at a premium aesthetically striking and extremely practical. Why not create the complete look by investing in other items within the range. Made in Malaysia the twin size trundle bed requires assembly. Baxton Studio BBT6598-Black-Full Lancashire Modern & Contemporary Black Faux Leather Upholstered Full Bed Frame with Tapered Legs - 14.24 x 56.36 x 79.76 in. The contemporary look is sleek simple and modern. To create your contemporary bedroom Lancashire will be a good choice that does not break your bank. Featuring detailed framework high quality black faux leather upholstery completes the look of this stylish and durable full size bed frame. Constructed of eco-friendly solid rubberwood frame the Lancashire features low side rails and low footboard providing an illusion of space to a small room. Wenge finishing tapered wooden legs lift the bed frame off the floor to create under bed clearance for storage. The bed frame could be used on its own or matched with selected headboards to create the contemporary look you desired. Made in Malaysia the Lancashire requires assembly. Baxton Studio BBT6481-Full-Grey Sophie Modern & Contemporary Grey Fabric Upholstered Full Platform Bed - 40.76 x 59.09 x 80.54 in. A celebration of simple uncluttered design the Sophie Modern and Contemporary Fabric Upholstered Platform Bed exudes an effortless style that adds character to any bedroom. Made from solid hardwood and plywood the bed frame is built to be a sturdy base for your mattress and the beginning of a sound nights sleep. Bold and blocky grid tufting design forms the panel headboard drawing all the attention of your guest. To reach the ultimate comfort level the headboard is heavily padded for your ultimate relaxation. 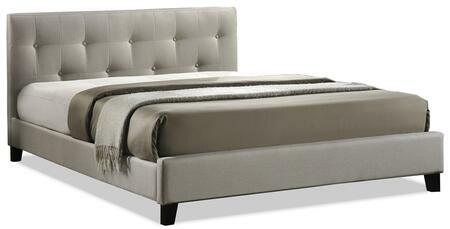 Chromed steel legs complete the modern look of the platform bed. This platform base bed frame is made in Malaysia. This bed is in Full Queen and King sizes. All sizes are in grey polyester fabric or beige mix linen fabric. The minimalist design of the Matiese dining chair will still surprise you with the subtle details in its design. The chair is the epitome of modern and contemporary-inspired design with its straight lines and simple silhouette. The Matiese's black faux-leather upholstery features a simple crisscross design stitched in adding a hint of unexpected detail. Black finishing on the chair's sturdy metal legs adds the final touch to an overall modern streamlined look. The Matiese features a foam padded seat and chair back to encourage hours of comfort. Add a cool trendy flair to your dining room reception area or other shared space with the Matiese. Made in China this chair requires assembly. The sleek and minimalist look of the Armand dining chair will bring cool vibes to your space. The modern and contemporary-inspired design of the chair is trendy yet timeless. The black faux-leather upholstery of the Armand is easy to coordinate with your existing decor and the horizontal slatted chair back design amps up the clean cool look of the chair. Black finishing on the chair's sturdy metal legs adds the final touch to an overall modern streamlined look. The Armand features foam padding and a gently arched chair back to encourage hours of comfort. This chair will be the simple solution you've needed to add that cool executive look to your dining room reception area or other shared space. Made in China this chair requires assembly. Baxton Studio Vera-White-Daybed Vera Modern & Contemporary White Faux Leather Upholstered Curved Sofa Twin Day Bed with Roll-Out Trundle Guest Bed - 38.03 x 42.51 x 85.22 in. The Vera modern and contemporary white faux leather upholstered curved sofa twin daybed with roll-out trundle guest bed has all the style your little girl wants and all the function you need! The unique curvy design and the details give an expensive look! Perfect in a guest room studio apartment or youth bedroom you'll have room for two thanks to the space-saving trundle! Maximize your space during the day and get the extra space you need at night - it's a no-brainer! Constructed of CARB-compliant solid rubberwood frame the daybed is fully upholstered in white faux leather with foam padding. Presenting comfort and style the Vera features versatile 3 in 1 multifunction as a sofa daybed and additional guest bed. Your kids or teens will be glad to have a daybed with a roll-out guest bed underneath. It can be dressed up with cushions for comfy lounging by day then has space for friends to sleepover by night. Made in Malaysia the Vera daybed requires assembly. Footboard: 12.09 High x 85. Baxton Studio London-White-Daybed London Modern & Contemporary White Faux Leather Arched Back Sofa Twin Day Bed with Roll-Out Trundle Guest Bed - 36.66 x 41.34 x 86.58 in. Featuring sleek sleigh styling and beautiful upholstery the London modern and contemporary white faux leather arched back sofa twin daybed with roll-out trundle guest bed can be the perfect fit for any decor from contemporary to eclectic. Constructed of CARB-compliant solid rubberwood frame the daybed is fully upholstered in white faux leather with foam padding. Gently flared arms arched back and stitching details showcase the modern and contemporary design. You'll be amazed at how this super versatile bed maximizes any space ! Use it in a studio apartment small bedroom or for tweens and teens who want space for hanging out and sleepovers! It's even perfect in a home office for extra seating during the day and comfy guest quarters at night! The London faux leather daybed is a great fit for any office guest room or den. Made in Malaysia the London daybed requires assembly. High-polished stainless steel sled base frame gives Toulon barstool a striking silhouette and the feel is actually quite comfortable. Thanks to the extra thick cushion covered in durable white faux leather Toulon barstool will bring a sophisticated modern look to your dining room kitchen space or home bar . The Toulan bar chair is an elegant combination of modern design and comfort. the bar chair requires assembly. High-polished stainless steel sled base frame gives Toulon dining chair a striking silhouette and the feel is actually quite comfortable. Thanks to the extra thick cushion covered in durable white faux leather Toulon dining chair will bring a sophisticated modern look to your dining room or kitchen space . The Toulan side chair is an elegant combination of modern design and comfort. the dining chair requires assembly. The sleek and minimalist look of the Armand dining chair will bring cool vibes to your space. The modern and contemporary-inspired design of the chair is trendy yet timeless. The white faux-leather upholstery of the Armand is easy to coordinate with your existing decor and the horizontal slatted chair back design amps up the clean cool look of the chair. Black finishing on the chair's sturdy metal legs adds the final touch to an overall modern streamlined look. The Armand features foam padding and a gently arched chair back to encourage hours of comfort. This chair will be the simple solution you've needed to add that cool executive look to your dining room reception area or other shared space. Made in China this chair requires assembly. The minimalist design of the Matiese dining chair will still surprise you with the subtle details in its design. The chair is the epitome of modern and contemporary-inspired design with its straight lines and simple silhouette. The Matiese's brown faux-leather upholstery features a simple crisscross design stitched in adding a hint of unexpected detail. Black finishing on the chair's sturdy metal legs adds the final touch to an overall modern streamlined look. The Matiese features a foam padded seat and chair back to encourage hours of comfort. Add a cool trendy flair to your dining room reception area or other shared space with the Matiese. Made in China this chair requires assembly. The minimalist design of the Matiese dining chair will still surprise you with the subtle details in its design. The chair is the epitome of modern and contemporary-inspired design with its straight lines and simple silhouette. The Matiese's white faux-leather upholstery features a simple crisscross design stitched in adding a hint of unexpected detail. Black finishing on the chair's sturdy metal legs adds the final touch to an overall modern streamlined look. The Matiese features a foam padded seat and chair back to encourage hours of comfort. Add a cool trendy flair to your dining room reception area or other shared space with the Matiese. Made in China this chair requires assembly. Baxton Studio LD2185-Pink-CC Mabel Modern & Contemporary Pink Faux Leather Kids Armchair - 21.7 x 22 x 15 in. Add an adorable focal point to your little one's space with the Mabel armchair. Constructed from rubberwood for durability the Mabel is upholstered in pink faux leather for luxe appeal. High-density foam padding and a wide back ensure a high level of comfort during those Disney movie marathons. Faux crystal studs add a touch of glamour. This armchair is sure to become your little one’s favorite spot as they read books watch TV and relax with friends. Baxton Studio LD2212-Pink-LS Gemma Modern & Contemporary Pink Faux Leather 2-Seater Kids Loveseat - 21.3 x 36.2 x 16.9 in. Add Stylish flair to your little one’s space with the Gemma loveseat. Constructed from rubberwood for durability the Gemma is upholstered in pink faux leather for luxe appeal. High-density foam padding and armrests ensure a high level of comfort during those Disney movie marathons. Diamond tufting and faux crystal studs add a touch of glamour. This loveseat is sure to become your little one’s favorite spot as they read books watch TV and relax with friends. Baxton Studio LD2192-Pink-LS Felice Modern & Contemporary Pink Faux Leather Kids 2-Seater Loveseat - 18.1 x 31.9 x 14.6 in. Personalize your little one's space with the comfortable and stylish Felice loveseat. Constructed from wood for durability the Felice Loveseat is upholstered in pink faux leather for luxe appeal. High-density foam padding and armrests ensure a high level of comfort during those Disney movie marathons. The curvy back and flared arms add stylish flair to your little one’s space. This loveseat is sure to become your little one’s favorite spot as they read books watch TV and relax with friends. Combine comfort and style with the clever and stylish Ava armchair and footrest set. Constructed from rubberwood for durability the Ava armchair is upholstered in pink faux leather for luxe appeal. High-density foam padding and a wide back ensure a high level of comfort during those Disney movie marathons. A matching footrest provides additional relaxation allowing your little one to put their feet up as they lounge. Faux crystal accents give the pieces a touch of glamour. This set is sure to become your little one’s favorite spot as they read books watch TV and relax with friends. Baxton Studio Frank-White-Daybed Frank Modern & Contemporary White Faux Leather Button-Tufting Sofa Twin Day Bed with Roll-Out Trundle Guest Bed - 31.79 x 42.12 x 82.1 in. The Frank modern and contemporary white faux leather button-tufting sofa twin daybed with roll-out trundle guest bed can accommodate up to two overnight guests. It's a sofa! It's a bed! Yet another bed! Constructed from CARB-compliant solid hardwood and boasting beautiful button-tufting and grid lines it's fully upholstered in white faux leather with foam padding. This 3-in-1 daybed is perfect in a guest room studio apartment or youth bedroom. Your kids or teens will be glad to have a daybed with a roll-out guest bed underneath. It can be dressed up with cushions for comfy lounging by day then has space for friends to sleepover by night. In your living room family room or home office the daybed is a good for extra seating space during day time while transforming into guest bed for two at night. Made in Malaysia the daybed requires assembly. Baxton Studio BBT6598-Beige-Full Lancashire Modern & Contemporary Beige Linen Fabric Upholstered Full Bed Frame with Tapered Legs - 14.24 x 56.36 x 79.76 in. The contemporary look is sleek simple and modern. To create your contemporary bedroom Lancashire will be a good choice that does not break your bank. Featuring detailed framework high quality beige linen fabric completes the look of this stylish and durable full size bed frame. Constructed of eco-friendly solid rubberwood frame the Lancashire features low side rails and low footboard providing an illusion of space to a small room. Wenge finishing tapered wooden legs lift the bed frame off the floor to create under bed clearance for storage. The bed frame could be used on its own or matched with selected headboards to create the contemporary look you desired. Made in Malaysia the Lancashire requires assembly. Baxton Studio BBT6576T-Beige-Twin Swamson Modern & Contemporary Beige Fabric Tufted Twin Day Bed with Roll-out Trundle Guest Bed - 32.48 x 87.4 x 43.31 in. Revealing intricate and refined delicacy the Swamson fabric daybed with roll-out trundle guest bed will be an elegant and yet classic piece in your living room or bedroom. Constructed of solid rubberwood and plywood the Rene daybed features two side panels with rolled arms. Upholstered in light beige polyester fabric with foam filled the Rene daybed showcases the details of a contemporary piece to match with your modern decor. To add more sophistication the front and side panels are decorated with buttons. For refinement the side panels are both trimmed with silver nail heads detailing the modern and elegance of the piece. Offering a number of different styling solutions this versatile 3-in-1 furniture multitasks as a daybed sofa and guest bed. For studio apartment and condominium where space is limited the Swanson could be your reading nook during the day time while transforming into your guest bed for two by rolling out the trundle. In your living room family room or home office the daybed is a good for extra seating space during day time while transforming into guest bed for two at night. Malaysia the daybed requires assembly. Baxton Studio BBT6576T-Grey-Twin Swamson Modern & Contemporary Grey Fabric Tufted Twin Day Bed with Roll-out Trundle Guest Bed - 32.48 x 87.4 x 43.31 in. Revealing intricate and refined delicacy the Swamson fabric daybed with roll-out trundle guest bed will be an elegant and yet classic piece in your living room or bedroom. Constructed of solid rubberwood and plywood the Rene daybed features two side panels with rolled arms. Upholstered in grey polyester fabric with foam filled the Rene daybed showcases the details of a contemporary piece to match with your modern decor. To add more sophistication the front and side panels are decorated with buttons. For refinement the side panels are both trimmed with silver nail heads detailing the modern and elegance of the piece. Offering a number of different styling solutions this versatile 3-in-1 furniture multitasks as a daybed sofa and guest bed. For studio apartment and condominium where space is limited the Swanson could be your reading nook during the day time while transforming into your guest bed for two by rolling out the trundle. In your living room family room or home office the daybed is a good for extra seating space during day time while transforming into guest bed for two at night. Malaysia the daybed requires assembly. Inspired by the classic turn of the century hospital dormitory beds the Celeste metal platform bed is versatile in design. Solidly made in tubular metal frame the Celeste is powder-coated with stippled black finishing. Featuring rounded corners with ornamental detailed castings and scrolled metal curves the Celeste is considered a timeless piece creating a relaxed look you'll love for years to come. Paired with sprung slats and center support legs it will give your mattress a comfortable and supportive feel. Made in Malaysia the Celeste requires assembly. Ease into your weekend with this casual reclining sectional sofa. You will be able to get into the most comfortable position possible quickly with the power reclining function. Constructed of pinewood and plywood the sectional sofa is upholstered throughout with bonded leather. For ultimate comfort the fixed cushioned seats are with webbing and springs. The armchairs on each end feature power reclining with built-in power mechanism. Sub ports located at the arms are also featured in the power toggles for a convenient way to charge your mobile devices or stream video on your tablet. The armless chairs and the corners are stationary improving your family's comfort on movie night with the addition of plenty of seating in your living space. The hinges connect each piece for a cornered sectional. Upgrade your child's bedroom with the Aeluin platform bed. The contemporary and children's inspired design is unique and harks back to a bygone era. The Aeluin is finished in a pleasant blue with a white trim on the edges of the bed. The bed features a row of three shelves in the headboard with the middle shelf tucked behind a hinged door. The door handle is a fun circular opening to help avoid knocking into any knobs. The top of the Aeluin's headboard is another convenient open shelf space perfect to store stuffed animals or decor. The internal bed space measures 36.03 inches by 78.74 inches. The suggested mattress size for use with this bed is 76 by 36 by 6.5 inches for the best fit. Made in Malaysia the Aeluin requires assembly.